Catch up on all our news in our weekly email newsletters. I would like to thank all parents who recently completed our ‘Voice of the Parent’ online survey. The aim of this survey was to capture the views of all of our parents and the responses have been very encouraging, with some outstanding feedback which I have shared with the staff. Some of the feedback and actions resulting from the survey are outlined below. As a school we welcome all of your comments, however, please do not wait for a survey to raise them. Should you have any concerns regarding your child, the staff or any other matter, please speak to Mrs Stokes on reception or email the school to make an appointment to see me. May I take this opportunity, on behalf of all of us here at Oxford House, to wish you a very relaxing and enjoyable Easter holiday. We are rearranging this trip to take place on a different day in July, following feedback that the originally proposed date coincides with a Taster Day at Colchester Royal Grammar School. On Tuesday, Form IV pupils refused to let the wet weather spoil their fun and had a very interesting and educational day visiting Mountfitchet Castle, a Norman Motte and Bailey Castle and Village. You are probably aware Essex County Council are reviewing the position of all libraries and both Prettygate and Stanway Libraries are under threat of closure. Hopefully the Easter break will offer the children an opportunity to visit their local library and help to avoid more libraries closing. We have decided to give the children more time to raise money for Read for Good. This is an excellent opportunity to use your local library and pupils can choose what they want to read – from comics to classics. Any additional money raised should be handed in after the Easter break. Your feedback has shown that the changes we have implemented to improve school communication and to make events in the school more accessible to parents have been well received. Your responses also indicate an appreciation of the visibility of and access to the Senior Leadership Team and praise for the high standards for behaviour and learning at the school. Communication has continued to improve, however, we acknowledge there are aspects we can refine and develop. In recognition of your responses, we aim to focus on reporting pupils’ academic progress on a more regular basis. We will also continue to work on providing more clarity to parents regarding pupils’ learning, including Montessori equipment practice, teaching methods, desired progression and end-of-year expectations. The school calendar will be populated in September each year showing activity for the entire academic year, including after school club options. Although the results of the recent after school club survey have shown that the Cognita wraparound care solution would not be feasible for our school, we are planning to introduce some exciting new after school clubs in the near future, such as LAMDA drama qualifications, yoga and other options, which will include our Reception pupils, and extended Breakfast Club hours. We are also looking at offering a wider variety of musical instrument teaching from the next academic year. Yesterday our Form IV, V and VI pupils participated in our annual Swimming Gala. The pupils demonstrated pure talent, comradery and discipline throughout the event. We are very proud to have some exceptional swimmers in the school. Congratulations to our Cup winners Gabrielle and Quentin and well done to everyone for competing. I would like to thank all the parents who came along to support the pupils. We hope the children have been busy reading for Read for Good. Please send in any money raised by Thursday next week. How Hill trip acceptance forms were due today. If you haven’t yet returned your form, please can we ask that you hand it in first thing on Monday morning. A letter will go out on Monday outlining details of a trip to the Tower of London on Tuesday 2nd July. Parents are requested to return the acceptance slip promptly, especially if your child will not be able to attend. We hope that many pupils will participate in our Easter Hat Parade on the last morning of term, Friday 5th April. Each child is welcome to bring their home made Easter Bonnet to school that morning. We have had some wonderful creations in the past. There will be prizes for the most creative girls’ and boys’ bonnets. There will also be a small treat for everyone who brings their bonnet and takes part in the parade. The rehearsals for our annual production at the Mercury Theatre on Saturday 5th May are progressing extremely well and it looks like it will be a very exciting and enjoyable afternoon. However, we are still in need of old school shirts and grey shorts or trousers for our cast of orphans, so if you have any lying around that you no longer need, please send them in! Children in FIV, FV and FVI will be taking part in the Swimming Gala on Thursday 28th March. The Gala will take place at the Corporal Budd Swimming Pool in Berechurch Road and will start at 10am. We appreciate that smart watches and fitbits are a feature of modern society, however, the increasing sophistication of smart watch technology presents a number of issues in a school environment. We therefore ask that no smart watches or fitbits are brought into school. After several training sessions over the last few weeks, our pupils have now completed their Bikeability training and received their badges. We are really proud of them for showing such great confidence and maturity during the course! The adverse weather has been trying to cause disruption to our plans this week. Our much anticipated Form IV trip to Stansted Mountfitchet had to be cancelled and has been rescheduled for Tuesday 2nd April. However, I am pleased to say that, despite the wind, FV and FVI pupils managed to take part in Bikeability on Monday. Pupils will be completing the Bikeability course next week. Parents of pupils in Form V are invited to an information session on Thursday 28th March at 3.15pm to discuss 11+ and secondary school registration options. On Tuesday 7th May, at 3.45pm, there will be an information session in the school hall for FV + VI pupils and their parents about this year’s residential trip to How Hill, Norfolk. A letter regarding the trip has been sent out to FV + VI parents today. Please could you ensure that the acceptance form is returned by Friday 29th March. Many of you will have come across the Learning Journeys that we use to support assessment in the Early Years Foundation Stage. Learning Journeys are a way of recording how your child learns and develops as they move through the school and aim to provide evidence of your child’s progress, often in the form of photos taken during activities throughout the school day. Please note that, due to the pictorial nature of the learning journey document, your child may be featured on photos in other children’s learning journeys. Photos taken of pupils for this purpose are always deleted from the school’s device as soon as they have been printed. If you would prefer NOT to have your child featured on photos for this purpose, please let the school know via email at info@oxfordhouseschool.net. On Friday 5th April, we will host our annual Easter Bonnet Parade. Children are welcome to bring their home made Easter Bonnet to school that morning. We have had some wonderful creations in the past. There will be prizes for the most creative girl and boy’s bonnet and a small treat for everyone who brings their bonnet and takes part in the parade. Rehearsals for the upper school production of OLIVIA! are progressing well and we are now at the stage where we are organising costumes and props. We will need to provide most of the cast with orphan costumes, so we would like anyone who can to send in any old shirts or old grey/black shorts/trousers. We will be cutting up and dyeing the shirts, so only send items you no longer need. The tattier the better! Individual character costumes have nearly been finalised, but we are in need of any baskets you may be willing to lend us for flower girls and street sellers. We also need a large wooden easel and a couple of wooden barrows if anyone has any lying around. We are very pleased with the effort the children have put into learning their lines. They will need to keep practising them right up to the performance, and especially over the Easter break! Many thanks for your continued support for the production, either at home or by buying tickets. There are still spaces for mums (or grandmothers) to take part in our Early Years hands-on art and craft activities on Tuesday 26th or Friday 29th March 2019. Please inform your child’s form teacher of your preferred day by Monday 18th March. This morning in assembly we launched this year’s Read for Good readathon. As a school, we want to promote reading for pleasure while also raising money to provide books to children in hospital. I have invited all of our children to take part. Everyone has been given a sponsor card and we will collect any sponsor money raised on Thursday 4th April. Happy reading everybody! We had lots of fun dressing up for World Book Day today to celebrate our love of reading. Children and staff looked fantastic dressed as their favourite book characters. Everybody enjoyed this celebration of reading and we are all inspired to read even more! We’d like to invite all mums (or grandmothers) to come along and take part in an Early Years hands-on art and craft activities with your child on either Tuesday 26th or Friday 29th March 2019. Please inform your child’s form teacher of your preferred day by Friday 15th March. Letters will go out next week regarding the Form I Trip to Colchester’s Natural History Museum on Tuesday 26th March. Please save the date for our Annual Residential Trip (FV + FVI) to How Hill, Norfolk, which will take place from 17th to 21st June. More details to follow. For our performance of Olivia! we are looking for Victorian props such as baskets for flower girls, fob watches etc. We also need a traditional wooden easel. Please contact Mrs Roome if you think you can help. Please note that babies and very young children cannot be admitted to the auditorium. Children currently attending Oxford House School, who are not performing, are very welcome to attend if they are wearing school uniform and have booked a ‘free’ ticket. I hope that you had an enjoyable half term break. On Wednesday, I was fortunate enough to watch pupils from Forms V and VI take part in the inter-school Cross Country race at the Colchester Rugby Club track. Twenty-five schools participated and Oxford House took a respectable 14th place. We are absolutely delighted and very proud of all who took part. Well done everyone! From now until the Easter break, Forms I, II and III will be going to the Headgate Theatre every Wednesday morning to rehearse for the Annual Production. Forms IV, V and VI will rehearse at the Headgate Theatre in the afternoon. Please can all children in Forms I, II & III come dressed in their winter P.E. kit on Wednesdays. No blazers, coats, caps or berets are needed and children will not need to bring in their school uniform. On Monday 4th March at 9.30am, we will be holding a routine lockdown safety practice. On hearing the lockdown signal, all children and teachers will remain inside the class room with all access points blocked, until an all-clear has been given. The lockdown alert is a loud continuous sound, not a bell. The practice forms part of our standard health and safety policies and procedures. World Book Day celebrations take place next week Friday 8th March. We invite all our pupils to come to school dressed as a character from a favourite book, and to bring the book in to school with them. Letters have been sent out today to parents of Form IV pupils about the annual trip to Stansted Mountfitchet Castle and Norman Village on Tuesday 12th March. The trip coincides with the medieval studies FIV are currently enjoying in their History lessons. We have received a letter from a neighbour of the school (12 Lexden Road) who has a shared driveway with The Colchester Royal Grammar School. They have expressed concern that a minority of parents are using this private driveway for parking. On Tuesday morning two of our pupils run out in front of the neighbour’s car while she was leaving her property. This area is very tight with restricted visibility from the parked cars and most definitely not a safe area for children to be running. Please refrain from using this private driveway when dropping off or collecting your children. Please can we remind parents of younger children to provide spare pants, socks and shorts (for boys) and spare knickers and socks/tights (for girls). Parents are requested to avoid sending pupils in with ornamental keyrings attached to their school bag, as these tend to easily break and go missing. One plain, inexpensive keyring per book bag is allowed to help children identify their bag. MoMo is a new viral game that encourages players to perform a series of challenges in order to meet ‘Mother Bird’ – a disfigured character with bulging eyes and untidy black hair. Light-hearted and fun at the outset, the game experience quickly darkens, absorbing players who are encouraged to perform acts of violence and self-harm through a series of progressively risky challenges. Spring Term reports have been sent home with the children today. I am very proud of all our pupils’ hard work and of what they have achieved over the last six months. Please use the acknowledgement slip enclosed with the report to confirm receipt and make any comments you may have to the form teacher or myself. I wish you all a very enjoyable and relaxing half term. We are delighted to welcome Miss Amber Fox-Hammond to the school. Miss Fox-Hammond will be taking on the role of Early Years Teaching Assistant. You will have been informed by email if your child has been selected for the Cross Country Team. Please can acceptance forms be returned by Monday 25th February, as the competition will take place on Wednesday 27th February. On Wednesday 27th February, we will be starting rehearsals for our Annual School Production at the Headgate Theatre. Please can all children in Forms I, II & III come dressed in their winter P.E. kit for the day. We encourage children to wear their white P.E. shorts under their navy jogging bottoms. If the weather is warm, they will be allowed to take their jogging bottoms off. Please ensure that children wear their navy blue fleeces and waterproof jackets. No blazers, coats, caps or berets are needed and children will not need to bring in their school uniform to change into when they return to school. Please check the lost property box in the entrance porch for any lost or missing items. Any unclaimed items will be removed and donated to charity on the first Friday after half term. It has been lovely to see so many of you attend the ‘Stay and Play’ sessions in Nursery and Reception this week. Please join us again for the next Stay and Play Sessions from 1st – 5th April. More images from this week’s sessions can be viewed on the website under ‘Latest News’. The safety and wellbeing of our children is fundamental to how we operate the school and the fire evacuation procedure is a key aspect of this. You may have heard about the fire practices we hold in school and we will be undergoing more of these over the forthcoming months to ensure that we are confident that we could evacuate the building safely at any time of the day. I thought it may be prudent to advise you as parents what you should do if you are in school during a drill (or indeed a real event). The fire evacuation procedure is outlined below. If the alarm sounds, please look out for our Fire Marshals (wearing hi-vis vests) who will direct you towards the designated Fire Assembly Point (Playground). Our Fire Marshals are 8 members of staff who have received full and up to date Fire Awareness training. Once on the playground, Fire Marshals will inform the Headteacher whether there is any evidence of the fire, whether the Fire Brigade has been called and what the progress of the evacuation is. Fire Marshals have been allocated specific zones and a plan a showing these zones is available for you to view at reception. It is important that all members of the school community adhere to the fire procedure; this will ensure that staff can manage an incident effectively and keep the children safe. Thank you for your support and co-operation. Thank you to all of you who have completed the Voice of the Parent survey. Your feedback is really valuable to us and we will give an update on actions taken as a result of the survey later this month. Mrs Garnham is recovering well after her recent operation and we look forward to her speedy return to the school. It has been lovely to see so many children wrapped up warm for school recently. Can we remind parents that woolly hats must be purchased from our school uniform provider Coes. Other hats are not permitted. We have noticed that some children are kindly sharing their tuck money with their friends, despite regular reminders from staff not to do so. If you think that your child might be sharing their tuck money, please remind them that this is not allowed. We have also been receiving some old and foreign coins, so please ensure that you send your child to school with valid currency. This week, we have been celebrating the start of the Chinese Year of the Pig. Our Chinese pupils in NI gifted lucky red envelopes to all children. NII pupils made dragon puppets and also created red envelopes containing chocolate coins. FI pupils made beautiful Chinese Pig drawings and FII learnt about the Heavenly Gate Race Story and the reasons for the 12 Zodiac animal rankings. On top of all that, we were delighted to welcome Mrs Liao in Reception yesterday to speak to pupils about this wonderful festival. Reception children had a go at playing mini cymbals, learnt about Chinese food and even had a go at using chop sticks. Happy Chinese New Year! More pictures can be found on the website under ‘Latest News’. On Tuesday. we were privileged to welcome Jaya and Rishan’s father, Mr Yoganathan, to speak to our Form VI pupils about career possibilities. Pupils learnt about the differences between working in the private and the public sector and found out about the opportunities available in both. It proved to be an inspirational session, encouraging students to be the best they can be and use their passion. It has been lovely to see the children wrapped up warm with hats and gloves this week. Hopefully we will avoid the snowfall for as long as possible but, should we get heavy snow and need to close the school we will endeavour to email you before 8.00am and put a notice on the school website. A weekly email newsletter, regular website news posts and social media channels help to inform about daily activities in our school. For more specific queries, staff are always happy to speak to you. Please note that, depending on the subject, a meeting may have to be scheduled within 1-3 days. To support you with subject terminology and expectations, a Maths booklet is being created to help explain the ways we teach Maths. Reading and Phonics workshops are planned for later in the year. Every term, NI, NII and Reception parents will have an opportunity to view pupils’ work during ‘Stay and Play’ sessions (the first sessions are scheduled for 11 – 15 February). For older pupils, there will be an opportunity to view and share work before Easter. We also hope you found the ‘Meet the teacher‘ sessions at the beginning of the school year useful. There is a strong focus on ensuring that pupils’ opinions are included in developing the school. As part of this approach, we have introduced School Ambassadors and House Captains. We are currently reviewing the results of the recent after school club survey to ascertain if the Cognita wraparound care solution can work for our school. In the meantime, our Wednesday after-school club will continue to run, offering indoor activities in Winter and outdoor fun in Summer. An arts and crafts activity is always on offer. We are currently looking to extend the Wednesday club to include Reception class children, but this will be subject to space and staff availability. Our recent attempts to run a choir club during break times and before school have unfortunately proven to be unsuccessful and we are looking at alternative options. Finally, we are planning to introduce some exciting new after school clubs in the near future, such as LAMDA drama qualifications and other options. Staff are required to undertake mandatory training to ensure that we comply with regulations and that knowledge, skills and understanding are kept up to date. Courses are always booked to avoid as little disruption to teaching as possible, however, occasionally staff may need to complete this training during the school day. On Monday, our new house captains Molly, Ishaan and Gabrielle helped to introduce the House System to pupils throughout the school. They handed out badges and presented the new house names and crests. House crests were created from drawings made by Keira, Dina-Kate and Max F.
We would like to remind parents that the annual school production will take place on Sunday 5th May, during the early Summer Bank Holiday weekend. Parts for the play are now being allocated, so please let us know if your child will not be able to attend. Please remember to keep an eye on the lost property box by the entrance gate for any lost or missing items. Some smaller items, including a silver ring, a necklace and a ‘jet cadet’ badge have also been found. Please speak to Mrs Stokes if any of these belong to you or your child. If your child has borrowed any items of clothing from the school, such as tights, shorts or underwear, please would you return them as soon as possible. Late collection is not permitted, unless you are collecting more than one pupil. In this case, you will need to arrive at the later time. Younger pupils are cared for by staff covering the late duty until 3.45pm. This term, we are introducing a school House System. Our current and previous Form VI pupils have contributed to a great extent to develop this concept over the past year, coming up with names and creating house crests. The House System aims to teach team building skills as well as developing perseverance, self-esteem and resilience. It will bring younger and older pupils in the school together and develop social solidarity, giving our pupils a greater sense of belonging within the school community. The new house captains will be announced on Monday and their names will be published in next week’s newsletter. House crests were created from drawings made by pupils and will be unveiled in next week’s newsletter. Initially the house system will be used for sporting events such as the swimming gala, cross-country and sports day. As time goes on we will use the House System for team incentives, team building exercises, competitions and much more. Could we ask that children in Forms II and III bring their Navy waterproof jackets in for travelling to and from swimming. Our grey coats don’t fit in the Leisure World swimming lockers and can therefore not be taken to swimming. Please ensure your child brings a hat and gloves to school, especially on days when they have PE/Games. Children go out to play twice a day, even when the weather is very cold. In the interest of health and safety, we request that you use the path opposite the entrance gate when arriving/leaving, and do not walk across the drive through the parked cars. Please do not allow your children to play among the cars in the car park. Parents are not permitted to park on or across the school driveways. We are well and truly back into school routines now. It’s lovely to see the children’s enthusiasm for learning at the start of the new year. Our new Nursery starters have settled into school life quickly, exploring the various learning activities in our classrooms and outdoor area. All class summaries for the Spring Term for your child’s year group are now available to view on the website under ‘Parent Login’. The summaries outline the learning taking place in each curriculum area and allow you to better support and enrich your child’s learning at home. Thank you to all parents who took the time to complete the on-line surveys sent out before Christmas on clubs and child care cover. The school is now reviewing the results and will be looking at different options available and will contact parents when more information is available. In the case of adverse weather, we will contact you via email as early as possible in the morning if it is deemed necessary for the school to close. A message will also be displayed on the website. We would like to remind parents that all pupils are expected to arrive at school no later than 8:50 for registration. It can be very disrupting and unsettling for the individual pupil and the class, if pupils are not ready to commence lessons at 9:00. In the interest of health and safety, we request that you use the path opposite the entrance gate when arriving/leaving, and do not walk across the drive through the parked cars. Please do not allow your children to play amongst the cars in the car park. I hope you had a lovely Christmas break and are looking forward to a new year full of fresh beginnings and opportunities. From this term onwards, we will be sending the Newsletter out on a weekly basis to improve communications between the school and parents. The Newsletter can now also be viewed in the email and there is no longer a need to open it as an attachment. After school clubs start next week, with the exception of Cookery Club which starts on 24th January. If you have not already done so, please complete the application form sent out earlier this week by School Comms and return to Mrs Stokes. 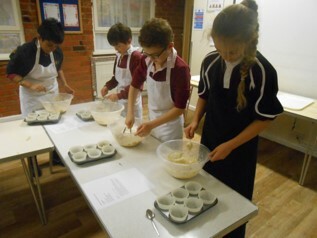 Thank you to all who have applied to Cookery Club. Priority will be given to those children who haven’t attended Cookery Club before. There are still some places available. We would like to invite all parents of NI, NII & Reception pupils to a Stay and Play session on the last week of each half term. Please feel free to visit between 8.30- 8.50 on any morning to look through your children’s work and spend time with them in class. Our first Stay and Play session will be held the week beginning the 11th-15th of February and our second invitation will be in the next half of the Spring term from the 1st-5th of April. We hope you will be able to join us and we only expect you to be able to visit once or twice during each stay and play week. Due to the renovation work that will be carried out this Summer to the Mercury Theatre, this year we will be holding our Annual Production at the earlier time of Sunday 5th May. 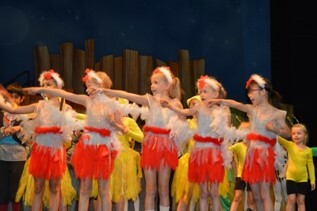 Please make a note of this date, as we expect all children from Reception age up to take part in the school production. If a holiday has already been booked for that Bank Holiday weekend, please notify us at your earliest convenience. Form V are completing a road safety awareness programme as part of their curriculum. This is a continuation of ‘keeping safe’ and supports work completed in Bikeability. The new term lunch menus are attached to this email and can also be found on our school website. A gentle reminder that children need to be dropped off and picked up via the side gate, and not via the main entrance door.